As a group of skilled artisans, we love using our artistic skills to create unique metalwork. When we received a request to build a custom decorative pergola, our designer Rachel, went right to work developing a design that would fit the client's tastes while at the same time addressing the many technical issues involved. This is a multi-step process which involves meeting with prospective clients, surveying the work site, conceptualizing and creating design sketches for approval, and finally, the creation of accurate shop drawings used for fabrication. Below, are a few images illustrating this process. This is an inspirational photo provided to us by the prospective clients during their initial design consultation. It is during the design consultation that clients discuss their desires. There are many details that are considered and discussed such as: overall goals, inspirations, aesthetics, and budgets. The consultation process also gives our staff an opportunity to offer their expertise in finding creative solutions for a proposed project. Typically, the next step is to survey the physical site where the work is proposed. This process allows our staff to understand the space, and measure the location of the project. Details such as access points, precise locations, overall environment, and possible obstacles are considered and recorded . All of the gathered information will then given to our designers to aid with both the initial and final design drawings. 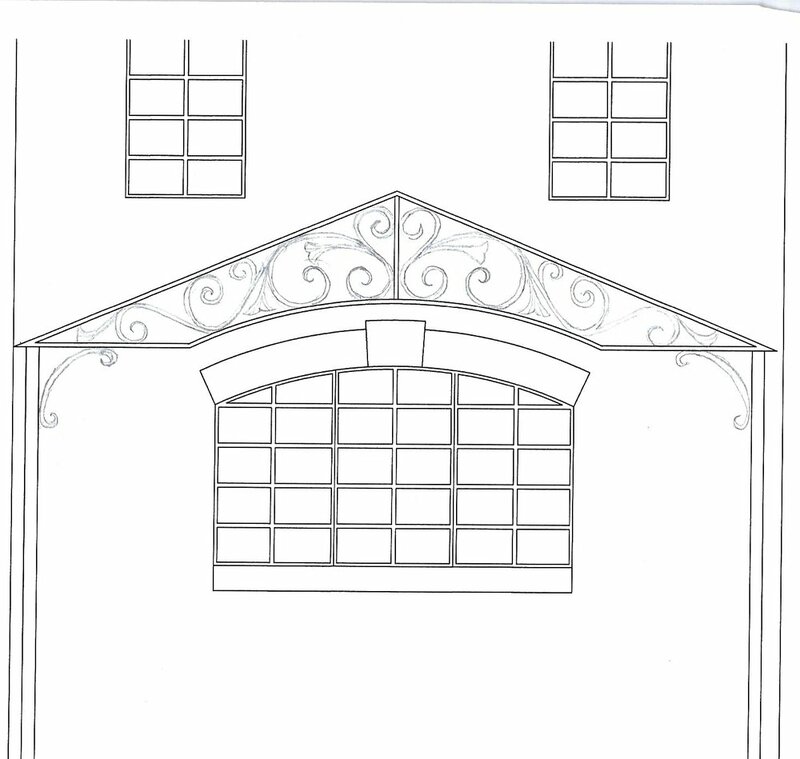 Here is an initial sketch of the proposed pergola. This design sketch was presented to our prospective clients for their approval. It is typical for a designer to create multiple sketch options for presentation. Design revisions are also common during this phase. Here is another design sketch of the pergola showing an alternate perspective of the proposed design. Once the final design and budget is approved by the clients, we create accurate technical "shop" drawings that will be used by our craftspeople during the building process. Above is a quarter view "shop" drawing of the pergola. Here is an elevation drawing of one of the pergola's trusses. This information provided on this drawings like these include: material sizes, overall dimensions, hole locations, and other various details important to the shop floor. Another elevation drawing of the pergola's trusses. This image shows two of our talented craftspeople with a finished truss. This, along with the remaining pieces will be rust proofed and painted before final installation. Please keep an eye out for the next blog in this series: "Building a Custom Pergola-Part II of III: the fabrication process.